For the third time Eastern Boarder and Oakley have teamed. This time turning out a super clean crowbar in two different lens options to celebrate our 20th year of East Coast destruction. One lens option is the black iridium which is more of a chrome finish and better for bright sunny days, the other option is the hi-intensity persimmon lens which is not as stealthy looking but better for those cloudy flat light days that the "Ice Coast" is famous for. 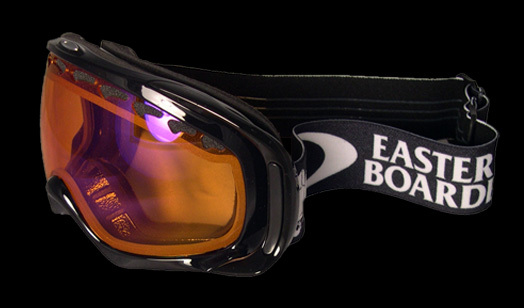 Both goggles are available now at all Eastern Boarder locations and also on-line at easternboarder.com. These wont be around long though (only 75 pairs total!) so bust a move soon if you want a pair! We didn't forget about skateboarding either. We just got in black and gold Eastern Boarder Thunder Hi 147 trucks that look sick! These are also limited in quantity and are also available at all Eastern Boarder stores and at easternboarder.com.